As was promised in the previous article that you read, we are giving you few more tips for effective blog marketing, which will definitely attract potential readers. Content can always be enhanced with good photography skills. Readers will share your blog if they like it. With good imagery and photography, the probability of someone sharing blogs that you’ve written will go up. Plain and simple, people like to look at things and love validation in their tastes so be sure to plan out your photos to get the shot that will drive traffic. A great example for a post that potentially has great photos would be writing a blog about a certain dessert recipe and including photos not only of the step-by-step process, but of course the finished product as well. Word and image formatting are also important in blog writing. Align texts on the left side of the blog and images at the center for a more professional and friendly-looking blog. There are variations of alignment that you can play around with but sticking to the classic method never hurt anyone and is the preferred method for a reason. Lastly, make sure that the title is in bold and has bigger font. Readers love reading blogs wherein the author’s personality shines right through their written words. It generates a sense of familiarity that makes people comfortable. Readers will feel like they are right in front of you, partaking in your thought process and ideas. The posts are more engaging and easier to read. Let your reader build connection with you with the help of your blog posts. Be overly confident while putting your best foot forward. It can actually get you further than you expect. Your blog might be pea-sized, however, you have make to it look as large as it can. Money can be an issue, but in any case, simply do what you can to have a decent format and an alluring header. You have to socialize with your readers to continue to grow your audience. If you have enough time, interact with your audience by responding to comments and answering their questions. By doing such, your readers will feel they are significant and are recognized as well. Above are just 10 of the countless tips to effectively market your blog, and if you do have one in mind that I did miss listing down, be sure to include and consider that prior to creating your very first blog entry. Facebook ads have gradually become a mainstay in the way that digital marketers and advertisers reach their target audiences with social media being the channel above all others that consumers flock to on a daily basis. Make no mistake about it, despite the advent and exponential growth and valuation of Snapchat, when it comes to ad revenue Facebook is still king with other a billion daily users. That being the case it makes sense for anyone who has a business, small or otherwise, to take advantage of the possibilities that come with creating Facebook ads. And after making the decision to pay Facebook to push your ads through its targeting algorithms the question becomes about what goes into an effective Facebook ad. I’d be lying if I said there was a definitive guide, but there are a few components that you can tweak to catalyze the success of your Facebook ad conversion. Visual content garners the attention easily and quickly as it’s obviously the first thing people will see when looking at your Facebook ad. If your ad image is attractive, your ad is bound to create an engagement. By attractive, I don’t mean any bold image will work. Rather, it should be an image that conveys your business strongly along with being eye-catching. Whatever content you use, your image is the first thing your target lead will lay eyes on. You cannot create an ad that will not connect with your target audience. If your target leads do not find your ad relevant, your time and effort is wasted and you will most likely have to restart from square one. You can use Relevance Score feature for Facebook ads to keep a check on your ad status. If you say you have the best services, your target audience may just skip your ad. Everyone calls themselves the best nowadays, often without the data to back up their claims. Be able to define your unique value proposition convincingly. If you say more than 1M people love you or you offer a discount of 25%, your ad have higher chances of getting clicked than by simply saying you’re the best. It doesn’t end here though. Your ad may have a great image, solid content and is targeted to the right audience, but if there is not a call-to-action it becomes a dull ad. CTA doesn’t mean a bright colored button asking users to subscribe or maybe signup only. It completes your whole process of convincing your leads. So, try phrases like “Get 25% off on XYZ“. Your ad requires leads to take actions immediately. Hence you will need to provide more context. You don’t need to surprise them. It is necessary you tell them what they are signing up for. For example, “Click here to signup for free“. Convincing your leads is not just restricted to an engaging image or context or content. Users have become smart and they are always looking at what benefits they will get immediately after signing up. If you have compelling offers or rewards that add value, it will speed up for lead capturing process. For example, you can give free PDFs, coupons, etc. Before the advent of social media, businesses advertised what they had to offer through simple methods such as billboards, TV commercials, print ads and even outbound marketing strategies like phone calls, word of mouth or even door-to-door visits. These days, you might still see those methods being employed, but it’s certainly without the fervor that they once embodied because in today’s world, filled with technological advancement, advertising occurs in the blink of an eye or the click of a button on the internet. From pop up ads to website banners, the availability of information across the web has enabled the world of advertising to push forward ferociously in the digital market, but still one channel remains the king of all digital marketing and that is social media. Meanwhile, social media marketing is where businesses come into play. The use of different social media platforms, such as Facebook, Twitter, Instagram, Google +, Pinterest and Instagram have been the best channels for companies to utilize as tools to convert potential customers to actual ones for some time now. And as they continue to evolve and push the envelope, so too do they continue to pave new roads for marketers to take in the pursuit of pushing product. Coming to the point though, why should the power of social media be limited to mega corporations with loads of money to blow on large campaigns. The simple truth is that it’s not. Social media is important to any business, but especially your small emerging one. Below are three of the reasons why. Americans, according to a 2011 report published by Nielson, allocate approximately a quarter of their online time on social blogs and networks. That being the case, it’s a given that potential customers are always present, waiting online and searching for products that they may be interested in buying. A proper social media presence and strategy is essential to driving funnel them to a conversion point where they purchase your product or avail your services. The truth is, people use their social media to express what they want the world to know. That can include the simple whims and details of their day to praise, complaints, and feedback on a variety of products and services they come across on a daily basis. You get to know the current trends based on what people post, and with that knowledge, you can take advantage of their wants and needs. 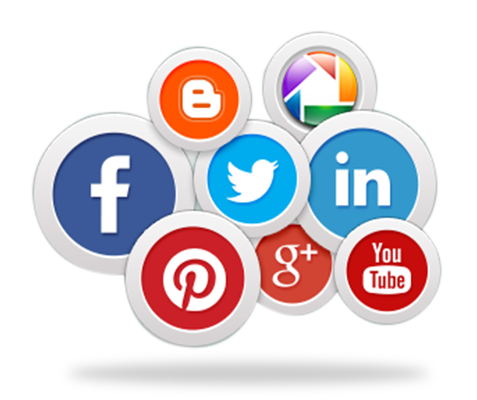 Facebook, Twitter, Instagram, Google +, Pinterest and Instagram are social platforms which are usually used by people searching for products and services nowadays. The good thing about social media is that they’re almost entirely free of charge. It’s a win-win situation. By leveraging these technologies properly, you can build a direct relationship with your clients and eventually continue to expand your business from small to big.